Take your boutique business to new heights by integrating an e-commerce website as one of the most important tools for your marketing strategies. As we can see, people have been flocking to online stores nowadays because of its many benefits. That is why you have to make sure you have a compelling website that will set your products apart from the rest. 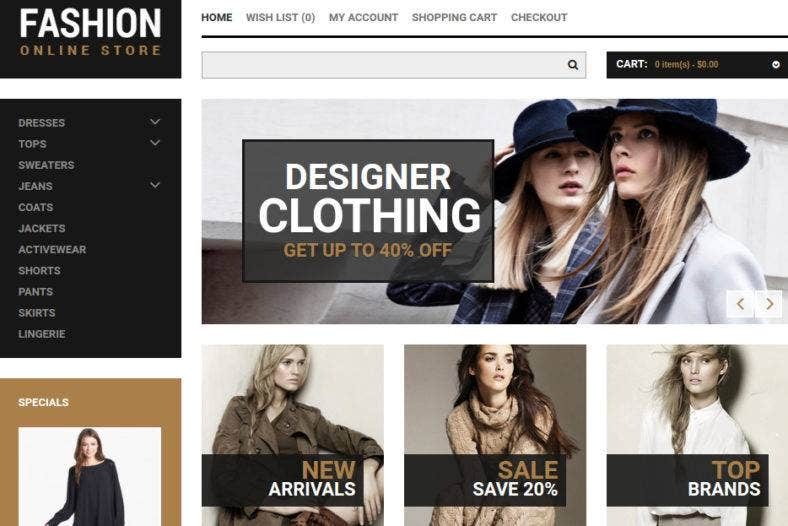 On this page, we present to you a collection of the best online boutique website templates to use for different types of online businesses. All these templates are carefully selected to provide you an extensive choice of attractive themes. 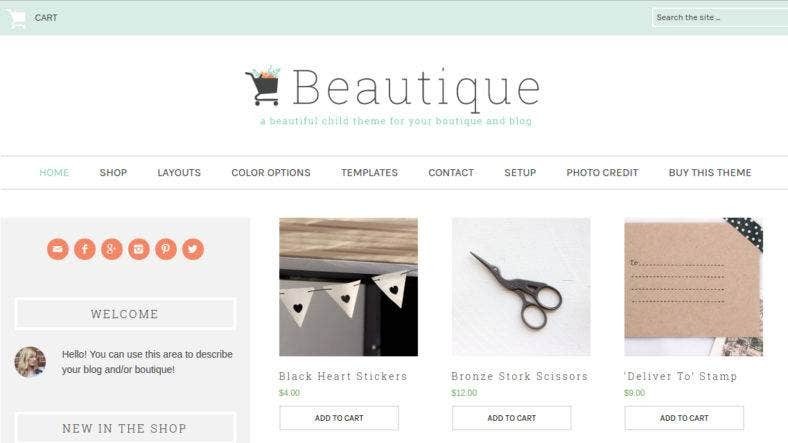 Packed with features, these templates are guaranteed to provide you enough functionalities for all your online boutique needs. 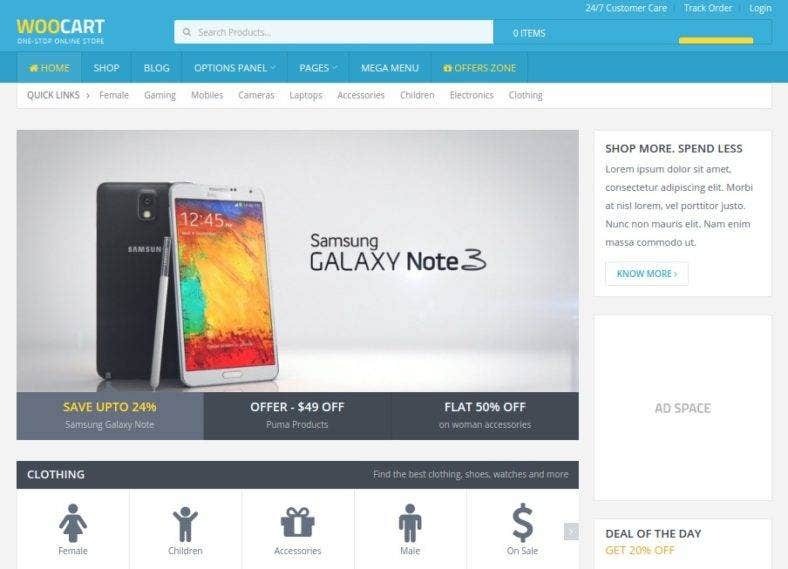 To start with, the above theme is a responsive e-Commerce website template based on the Twitter Bootstrap framework. Built with HTML5 and CSS3, Bistro Store comes with over 25 design and layouts to choose from. It also features a mega drop down menu to organize your categories, a LayerSlider to let you create unlimited slideshows on your pages, and one-click color and background change combinations. With its vast number of features, Bistro Store is definitely a perfect template for fashion boutiques and online clothing stores. 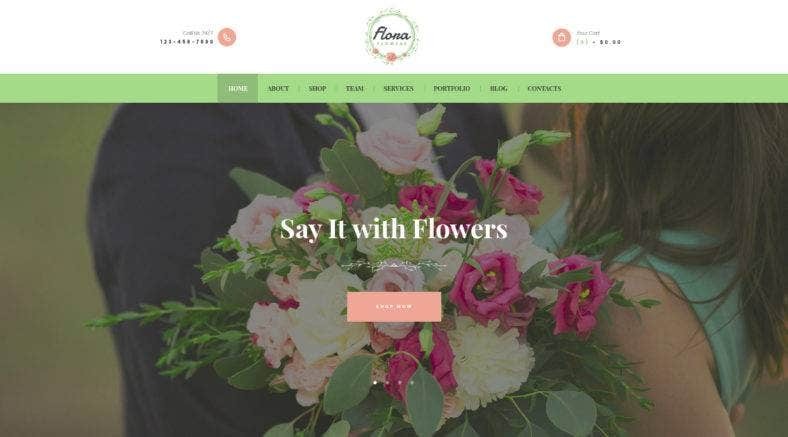 For every successful florist, Flora is a stunning theme that is made exclusively for flower boutique websites. With a color scheme that reminds you of a large field of flowers, this template has sections for different services such as florist services, bouquet designs, events flower decors and ceremony decorations. Powerful as it is beautiful, Flora is a responsive template with an intuitive visual interface and a comprehensive layout that will surely look great on any device. It also comes with useful plugins that enhance its functionality. 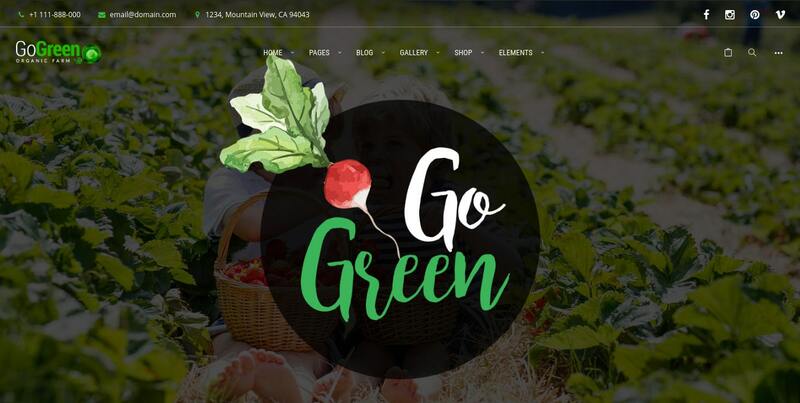 Another website template made with Mother Nature in mind is Go Green. This a unique and modern WordPress theme perfect for every market business out there. With this template, you can sell organic and processed food, fresh produce, and groceries in a rather fresh and raw manner. Among its features are a well-structured section separator, pre-defined custom-made pages, unlimited header and footer layouts made with WordPress’ Drag and Drop Builder, and other dynamic attributes. Zorka is a Magento e-commerce theme made for every type of fashion shops and fashion websites. It has an elegant but strong design aesthetic as it uses a pastel-colored color palette with bold fonts and texts. It’s an extremely powerful template that comes with a bunch of awesome features such as ajax price slider, custom grid modes, revolution slider, quick install package and more. Fully responsive and highly customizable, Zorka has a product-centered layout with retina ready icons and a variety of skins to choose from. A cute and almost sweet-you-can-lick-it WordPress template, Boutique Kids comes with vintage styled curved border, menu flag, header hanging boxes and different sidebar shapes. This theme is as artsy as it is functional because of its many features included in its graphically detailed responsive design. 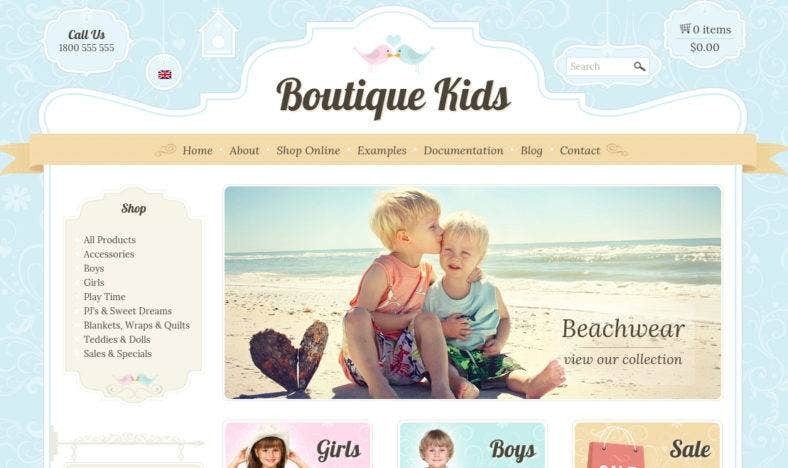 Using the Element Visual Page Builder, Boutique Kids is easy to use and customize. It’s compatible with the WooCommerce system, so you can sell your baby products easily online. Boutique is a premium Prestashop theme that is elegant in design as it is heavy in features. This modern and professional template features more than 20 pre-made homepage layouts, a mega menu, a number of product display styles, as well as unlimited header and footer styles. Boutique is fully responsive to make sure that your website looks good on all devices. 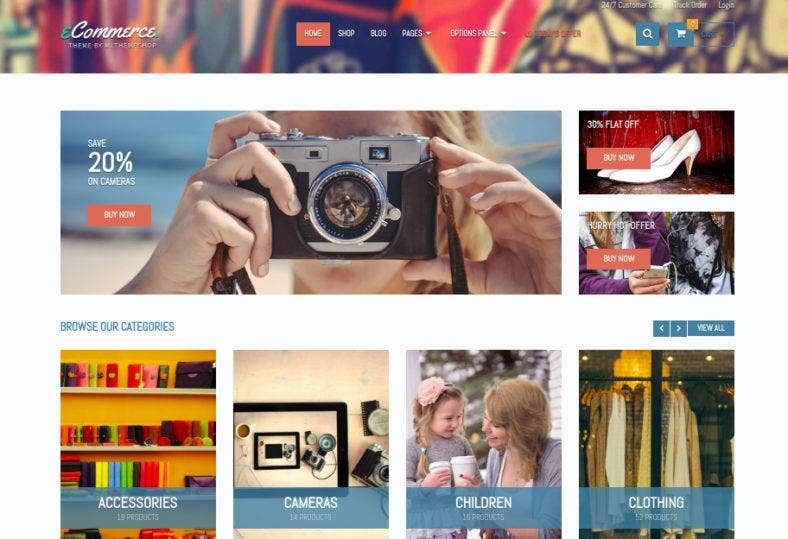 It’s a super template that can be used not just for online fashion stores but also for handicrafts, accessories and even gadgets shops. If you’re looking for a clean and minimalist boutique website design, then you should consider this theme. A no-fuss feature-heavy template, it boasts of both flexibility and versatility with its customizable set of attributes. Its features include multiple responsive layouts, easily customizable colors, WooCommerce compatibility, a full-width feature slider, promo boxes, sticky menu, and social media icons, among others. 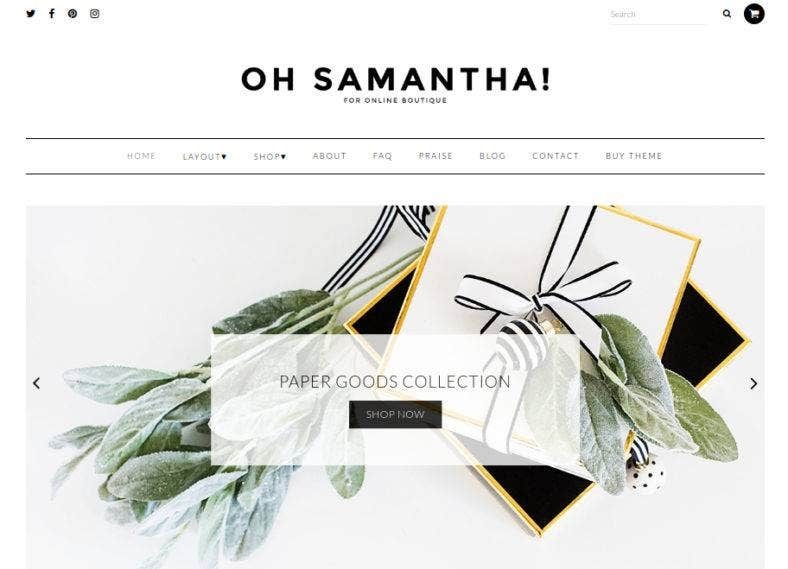 With all these functionalities, Samantha is definitely a design boss when it comes to online boutiques. 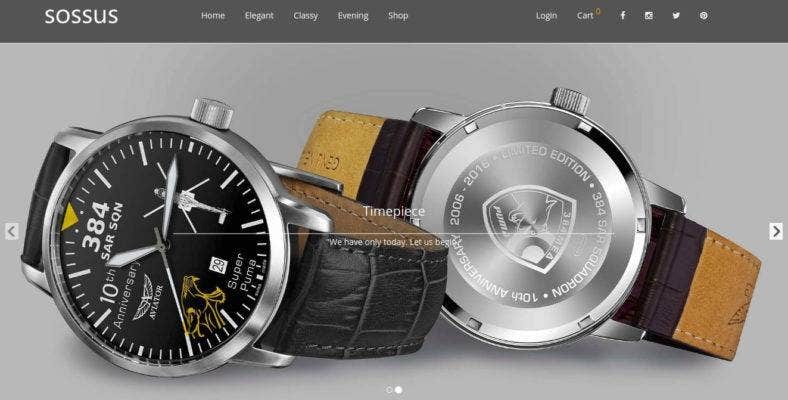 A multipurpose WordPress template, Sossus has a unique and highly efficient design that is great to use for different high-end products such as fashion accessories, sports equipment, electronics, and gift products. Built with Bootstrap and made with modern HTML standards, Sossus is rich in advanced features that consist of multiple front page layouts, video sections, product slider, galleries as well as some WooCommerce settings. Using this template for your boutique website guarantees an eye-catching online presence. Beautique is another feminine-looking template that true to its name, features a beautifully designed layout with a pastel color scheme over a clean white background. Made as a content management website template, Beautique has a WooCommerce-ready feature, so it’s easy to switch it to an online shop or boutique. Or better yet, you can have both on one website. Other features include a custom homepage, custom mobile menu, optional secondary menu, six layouts, three page templates and five color options. A WooCommerce theme for online boutiques, this template is great for any eCommerce shops and online stores. It features a clean and minimalist design with a large header slider that will surely highlight your products and catch your potential customer’s attention. Other features are responsive slider and carousel, custom background image and background color, and much more. This theme is built with HTML5 so, it’s fully responsive and will surely look good across all browsers and on every device. 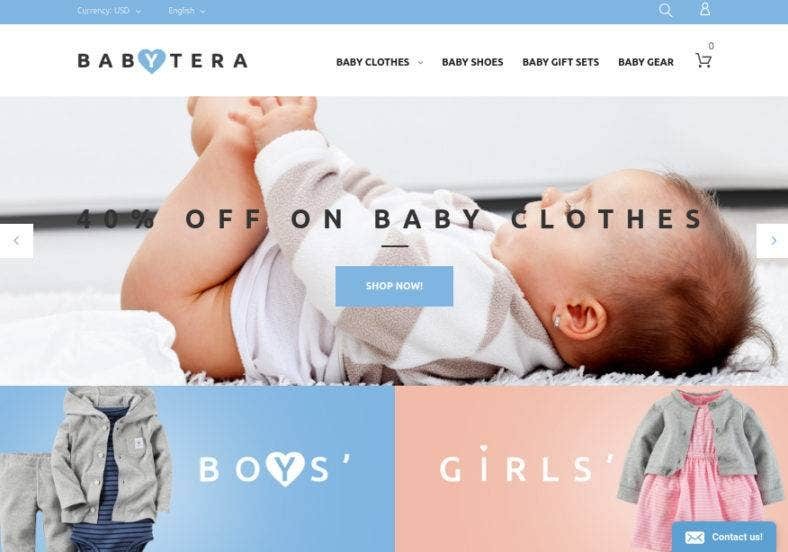 Another boutique template for baby stuff is Babytera, a baby store Magento theme with a clean and visually appealing design. Its use of baby pink and baby blue colors is perfect to showcase baby products that mothers and fathers alike would surely love. With features such as the fixed-to-the-top MegaMenu, DropDown cart, and back-to-top button, Babytera is a dynamic template that will certainly provide your customers a seamless and exciting user experience. Fully responsive and retina ready, it’s a good-looking template that you should consider. 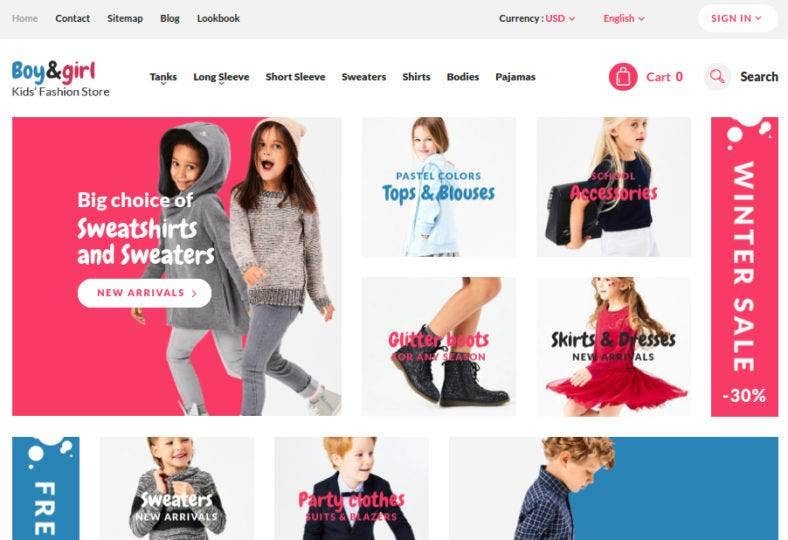 Boy&Girl is a responsive PrestaShop theme for kids fashion and clothing boutiques. Created using the Mega Layout Builder, it includes 3 pre-made layouts and a lookbook in an ultra-responsive design. It is packed with a bunch of exclusive modules and features that will help you supervise your online store efficiently. With the help of TM Megamenu and TM Search, you can build complex but comprehensive menu structures and add a live product search to your store to optimize its usability. 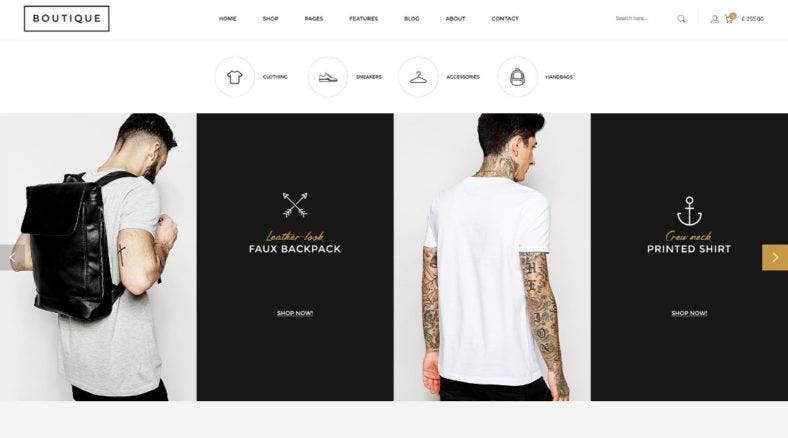 If you’re going for a dark and edgy design aesthetic, then this fashion online store OpenCart template is the right one for you. One of the best things this theme has is it skillfully processes your images so customers can take a better look at your products. Bold texts and banners are placed on semi-transparent blocks for better readability, while products are categorized in a vertical drop-down menu located at the left sidebar for easy navigation. A personal favorite, this template has a classic web design idea so it works well for other products, too. 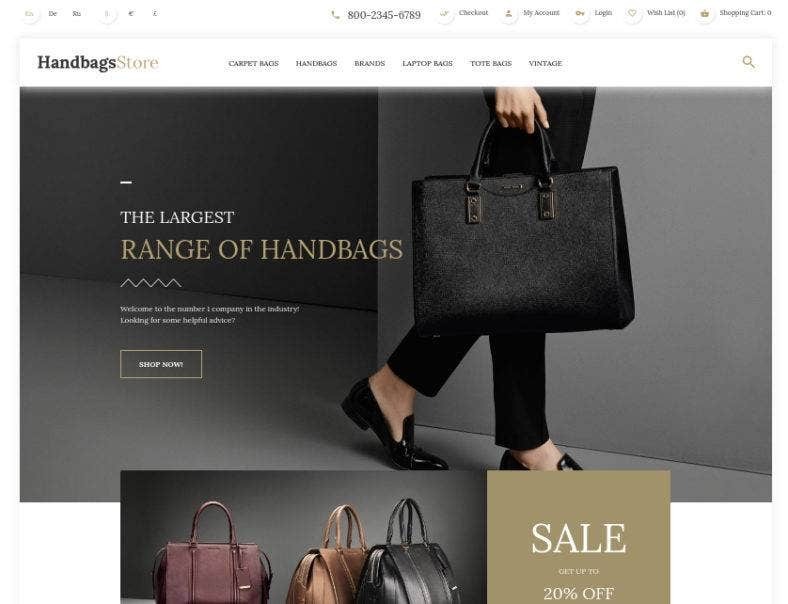 Jewel, as its name implies, is a jewelry Prestashop theme that works not just for jewelry shops but also for fashion, gadgets, and furniture stores among others. It is integrated with Font Awesome Icons, cool product labels, list or grid category view, and a responsive homepage slideshow. And with its black and white theme, Jewel doesn’t take the spotlight away from the featured products but rather exudes an aura of elegance and sophistication to the overall design. Finally, a theme for handbags. This OpenCart template comes with a luxurious and chic feel perfect for showcasing high-end to medium-class handbags. Built within the Bootstrap framework with easy-to-customize HTML and CSS components, this template boasts of flexibility and efficiency. It also features a responsive layout design with parallax effect to give your customers a great user experience whichever device they are using. This theme also works well for other fashion items such as shoes, watches, and accessories. This wedding OpenCart template is specially made for wedding boutiques and shops. With its minimal and simple design, the theme definitely represents the purity and freshness of every bride out there. Also featuring essential attributes such as a header slider to showcase your best products as well as promos and discounts, a drop-down menu to ensure navigation is easy and smooth, and banners to highlight services and other offers. Together with its black and white color palette, this theme will surely make your wedding boutique stand out. WooShop is a modern and highly professional WordPress theme that features the traditional grid layout and classic sidebar menu. Optimized for WooCommerce, it is also loaded with premium customization options, a stunning responsive layout, and an excellent solution of features. WooShop is also speed optimized to guarantee an amazing user experience, and is SEO ready to easily jumpstart any digital marketing strategies. This template is great for different kinds of products, from clothes to graphic designs. 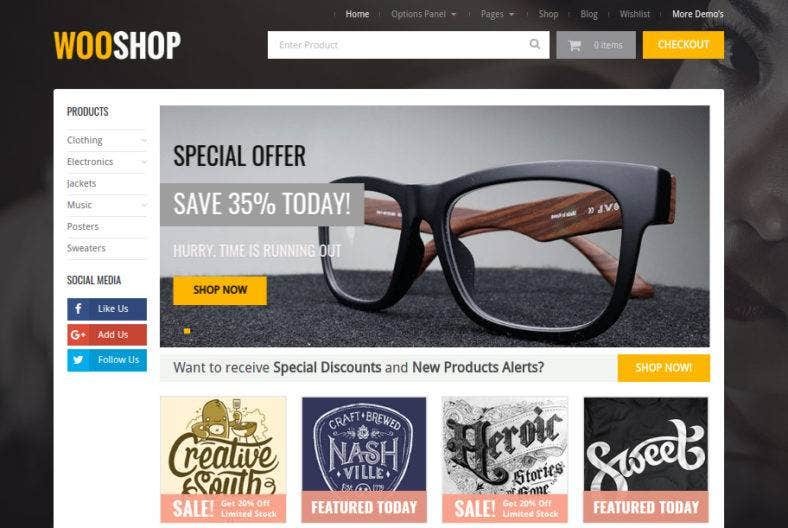 eCommerce is another WordPress theme for all kinds of online shops. A mobile-friendly responsive template, it also features four well-designed demos to choose from, a wishlist, and quickview options. It has a modern and clean–almost minimalist–layout that will definitely catch any potential customer’s attention as well as provide a superior user interface to enhance their browsing experience. With these attributes, you are sure to generate more sales, turnover, and profits. This is an eCommerce multipurpose WordPress theme that lets you showcase your products beautifully and bring about an increase in sales. 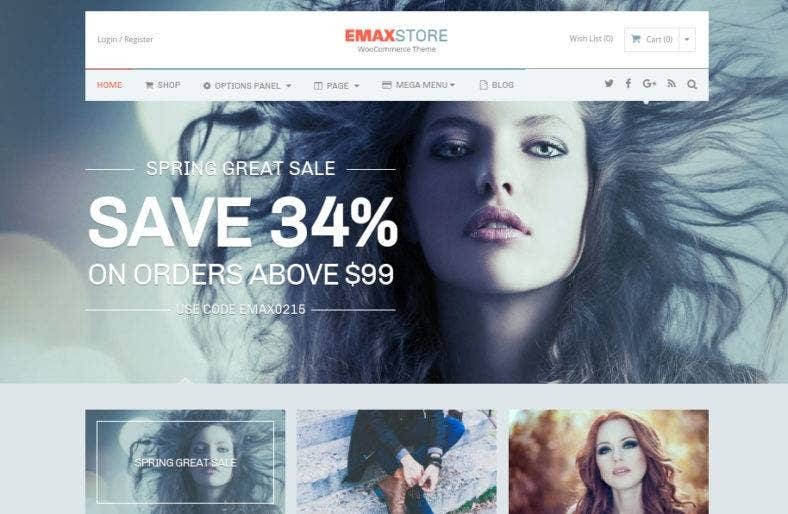 eMaxStore is a beautifully designed template perfect for multiple purposes and many kinds of online shops and boutiques. With a few standout features such as wide header slider to feature promos, discounts or new products, parallax effect, and fluid responsiveness; eMaxStore will let you show off your products with style and efficiency. Last but not the least is the ultimate eCommerce WordPress template, WooCart. It comes with powerful features such as AJAX Filters and Add to Cart, SEO mastered content structure, speed optimized layout, and a unique fluid responsive design. Built with HTML5 and CSS3, WooCart also includes special features for sellers so it’s easy to use and customize. Boasting with high flexibility and versatility, this is definitely a template that will help you sell more and earn more. Dressing up your online boutiques and shops with one of these templates might just be the best decision you will make. As each template is integrated with different powerful features, the type of website you will be able to come up with will definitely become the most effective and the best marketing tool that can surely take your business to a different level.